“If I had a dollar for every time I heard that…” is a popular phrase many identify with in a world of varied interests. We’ve all got that something in our lives, whether it be a fitness routine or an invention, that keeps others asking the same question (or making the same comment) over and over. 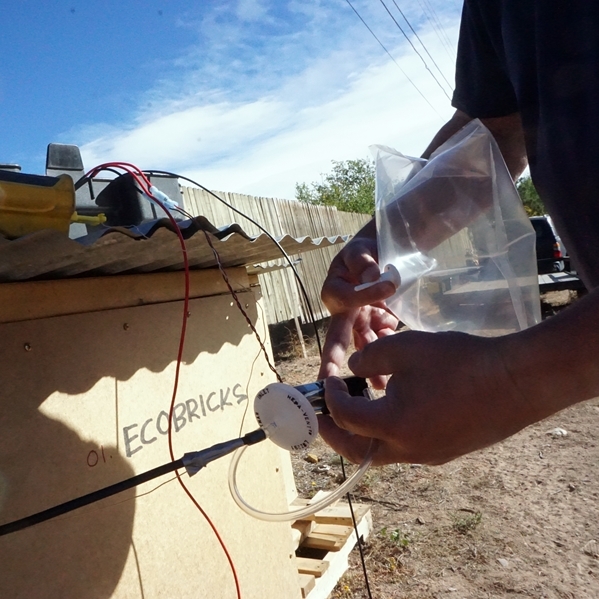 For us at Upcycle Santa Fe our ‘if I had a dollar for’ question is, “Don’t ecobricks off-gas? They’re made of plastic… so aren’t they unsafe as a building material?” Sometimes we respond to this with questions of our own, such as “Are you wearing plastic (polyester) on your skin right now?” or “How many times every day do you touch plastic to your mouth or unwrap food to eat that is wrapped in plastic?” For us, these seem to be more serious health concerns than living in a well-built home with upcycled plastic insulation in the walls. The emissions question remains though, or at least it did before our first research experiment with Los Alamos National Laboratory (LANL). After a year of planning, fundraising, building, testing, and finally reviewing, Upcycle Santa Fe has received some answers to the questions of off-gassing and emissions. 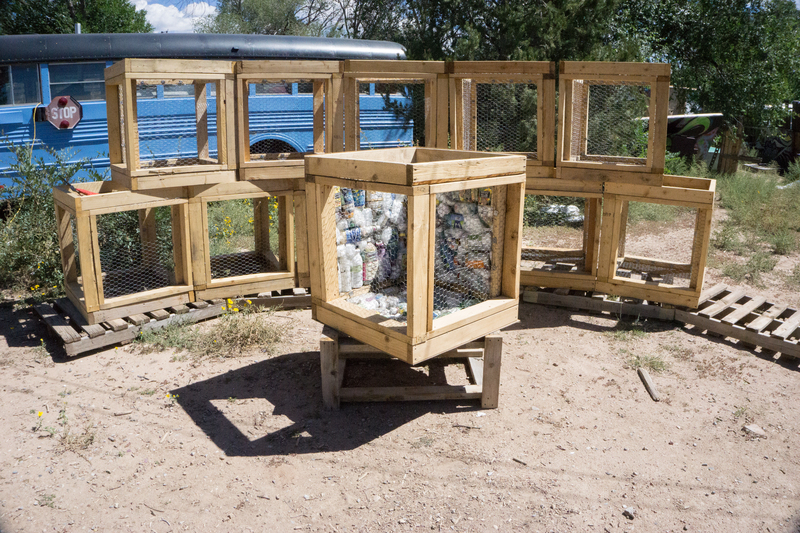 Upcycle Santa Fe was a 2016 recipient of a research grant through the New Mexico Small Business Assistance (NMSBA) program. We knew right away we needed to use this funding to benefit our inquisitive supporters and partners worldwide. There was a Doubting Thomas that needed our attention, and we hope you’re paying attention now! With funding assistance through NMSBA, Upcycle Santa Fe worked alongside LANL to get these tough questions answered, and much to our enjoyment (and also relief!) the lab results are in and favorable to the continued usage of plastic waste as an alternative insulation material. There you have it, folks. Confidently move forward with stuffing those ecobricks and using them in building projects because this good news actually goes a little further. Of the 12 insulation test subjects submitted for this research ecobricks and mixed plastic bags performed on par, and in some cases better than conventional and recycled insulation material (i.e. : recycled PET #1, recycled denim, R-Tech foam, and fiberglass batt) when it comes to R-value. What on Earth is R-value? It’s the measure of resistance to heat flow through a given thickness of material. The higher the R-value, the greater the resistance, or in other words, the insulation actually works to keep your structure warm in the cold, and cool in the hot. Rigid fiberglass, ecobricks, and mixed plastic bags were the top three performers in R-value, respectively. Coming in closely behind were recycled PET #1, carton ecobricks and Ubuntu-Blox. So breathe easy, literally. The alternative insulation materials you’ve been building with, or are planning to build with, should work as ideally as conventional insulation at a fraction of the cost, and not at the expense of your local landfill or beach. Knowledge is power! Empower yourself and your community with these lab results. 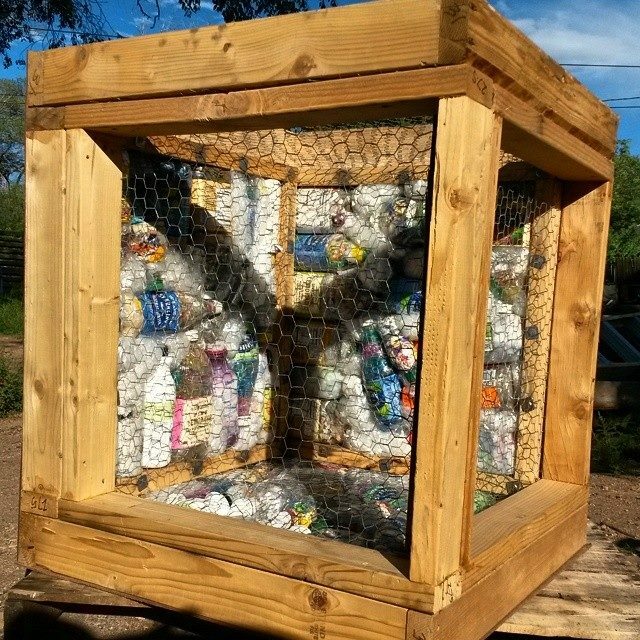 Encourage your community to begin, or continue, building structures using plastic waste as a safe and reliable alternative insulation material. Oceanographers believe there are 5.25 trillion pieces of plastic debris in Earth’s oceans. Americans, alone, are sending 121 million tons of waste to landfills each year. Please let that sink in, and we’ll be right back.